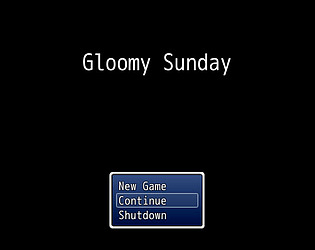 Rpgmaker Dlc: Zombie survival, modernday tiles, futuristic tiles, Gloomy sunday piano cover, several sound effects from freesound.org and noiseforfun.com. More detailed credits included. OK! So now that I knew that there was an ending, I replayed this game. The story is pretty good, I actually was pretty into it. I think it still needs polish overall. I'll check the walkthrough while writing this comment. OH, there's a good and bad ending. I see. Ok, well, I got the good one because I'm duh bess! There's nothing really pointing to the idea to burn the music instead of playing it. So maybe you can add a bit of lore to the game so that there's a choice. Something about someone maybe thought burning things was cool and good for excorcism... I dunno! Other than that, getting to play through it was a treat, just needs more depth and polish! Ahhhhhhh met a few early ends with the ghost! Maybe a restart from the last cutscene feature would be better? I think the tiling lacks a little dimensionality as the perspective looks a little odd. 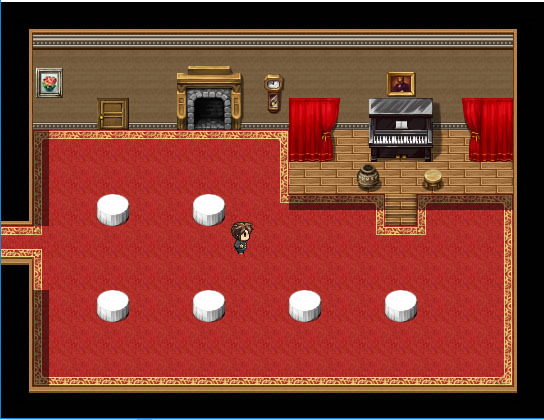 The sprites could also be a bit more appropriate e.g. for the ghost. Otherwise, gameplay is solid, the main theme is great and the lack of music when exploring was also a little chilling. Maybe giving us a short cutscene... Maybe the ghost kills something in front of us and that makes it clear. Maybe just giving us more room to get out of there would be good. Even an inner character monologue that expresses the need to run away would be solid. I'll have to play again then =P Definitely one of the hardest things about creating a game can be clear objectives and endings. Maybe putting a Continue screen at this point with an auto checkpoint before the ghost kills you would be sufficient? That way it doesn't look so final. Well, that was a neat little RPG game. Well put together but I couldn't figure out if there was more... I got the laundry item but couldn't find it anywhere in my inventory? Is it interactable? Is there more than one ending? Thanks for trying it! There's two endings. The teddy bear in the laundry room was mostly a little joke item that didn't get finished in time. There's a walkthrough included that tells you how to find both endings, but let me know if the walkthrough isn't clear enough.